I want to say that it's brutally funny, but not because it's funny in a superlative term, but because it's brutally honest and that makes it funny, but it also makes it sad for us Romanians - the way he sees us, which is how we see us as a nation, when we are truthful about how we really are. There's good and there's quirky, you might say, but then there's bad and very bad and, sadly, we make fun of the bad instead of trying to correct it. But how would the foreigners make fun of us otherwise? In Romanian it's called "a face haz de necaz", which is to say, to make fun of a mishap or misfortune. It's something the author learned a lot while living here. The book has a pleasant general tone and is quite funny for the better parts - funny as in haha but also funny that conceals tragedy. Excellent read, if you can stand the truth and lough about it!I was intrigued by the title, coming from a Balkan country, and somebody compared the writer to Bill Bryson (whose books I love), so I had to read it. And I wasn’t disappointed, I laughed a lot and could place each of the stories in my own country, Bosnia. Particularly amusing are the stories describing old-fashioned services, like in the post office, with which we are all stuck (as long as it’s happening to someone else).These are not sugar-coated stories, it is how it is, though I’m guessing inexperienced foreigners might suspect some exaggeration. This book has a strong personality. The author has a fresh and interesting way to see and to present those details of the everyday life of a country that make it unique, but are often difficult to see from inside. Is it funny? Is it sad? Both. And we certainly need to see both, if we want to cure. Great style, i have enjoyed the reading. Here's what the media / literary critics say about 'Never Mind the Balkans, Here's Romania', and its author« He's likeable, lucid, with a big soul and a lot of humour. The English journalist offers neither a façade, nor caricature, but reality - today's Romania.Mike Ormsby has not the slightest intention of flattering us, nor of treating us with the superiority of those coming from the civilised world to the backward East. He insists on writing exactly what he sees, lives and feels in today's colourful Romania. His western mentality is that of someone formed in a system that has worked for generations, of someone who has in his blood politeness and respect for law and human rights, as well as civic responsibility. This way of thinking is constantly contradicted by aberrations that to us appear normal.Put simply, it's very hard for him to understand the lack of reliability and punctuality, the infernal and idiotic bureaucracy, the national institution of bri es and petty envy, the bad manners, the impunity of cheats and the ostentatious arrogance of the nouveau riche, the poor work ethic and cruelty to animals. » by Adriana Bittel, Formula AS« Romania has found itself a British Caragiale. The book makes you die laughing at out national failings, the sort that drive some less-tolerant Romanians abroad. » by Raluca Ion, Cotidianul« He does not flatter or indulge us, nor does he play our national sport of turning away, indifferent. If Mike was a time traveller, he'd take antibiotics to stop the Black Death. But that would be impossible. It would mean changing history. » by Elena Vladareanu, Romania Libera« The stories are juicy, full of charm, unified by a lot of English humour » Claudia Craiu, Ziarul de Iasi« Romanian clichés treated with intelligence and a unique, subtle irony. This merits pride of place on any bookshelf. » Mihai Gadalean, Foaia Transilvana« A bittersweet, accessible read, where Romanians can see their portrait in an English mirror. I devoured it in one sitting, with a range of feelings: from exultation to indignation, from surprise to who-cares, from pleasure to anger. A very well written book, carefully constructed and extremely intelligent. If it travels abroad, it will have a lethal effect. » by Eduard Tone, editor, FHM« Too many books or articles present Romania and its people in beautiful colours and too many stress the dark side, until it shocks. This author succeeds by showing a high degree of professionalism to present the facts as they are with subtle irony when the context requires. » Expatromania.ro<> by Frank O'Connor, Vivid (expat magazine, Romania)« Ormsby recounts the mishaps, muddles and privations that make daily life hard in Romania for Romanians, and even harder for outsiders. But through it all comes a strange sort of affection for a place, and its people, as they struggle to regain their sanity after the years of madness under Ceausescu. The author... Hamlet-like, refuses to go with the flow and battles against the slings and arrows of outrageous fortune with a relish that leaves most of his Romanian friends, and probably not a few readers too, bemused but amused in equal measure. If you're going to Romania, it's better than a guide book. » by Ivor Gaber, Tribune (UK)« Mike Ormsby sees Romania very clearly. Sometimes we surprise him, sometimes he challenges us. Nevertheless, he clearly appreciates our charisma, confidence and warmth. » by Mihaela Spineanu, Elle (Romania)« It's about Romanians in transition, still tainted by the national experience of Communism, those who do not seem to know how to use the freedom they won in 1990. The book offers Romania a mirror, made in England. » by Christian Mititelu, former Head of BBC World Service Romanian section. A lovely book about a lovely place.In the Romanian version of the creation myth God creates the earth and starts assigning different people to different lands, but realizes suddenly that one land has every natural resource and would dominate the world. "I know", says God, "I will give it to the Romanians, because they would never manage to conquer the world. ""Never mind the Balkans, here's Romania" is a wonderful book that brought back many happy memories of the two years that I and my family spent in Romania from 1994-1996. I read the book cover to cover the minute it arrived, and couldn't put it down. In fact I read many of the stories outloud to my family. Romania and the Romanians are wonderful, but yet at times maddening. Romanian humor is itself often self-deprecating, and Mike Ormsby conveys just that gentle, loving sort of humor in portraying Romania.You will love Romania, and you will love this book. The book's best asset is its awesome, occasionally hilarious writing style. You can feel the journalist behind the writer: Mike Ormsby is attentive to details, straightforward yet still able to convey the atmosphere, capable of conveying his point of view without losing himself in rants or considerations.However, the stories wander a bit aimlessly, sometimes going back to the same themes over and over without necessarily saying new things about them: reckless drivers, stray dogs, that sort of thing. After a while, it started feeling a bit repetitive and limited, as if it never dared to outgrow its initial scope, but fluttered around it like a moth. Still interesting, still fun... yet it felt like something was missing. I find "Never mind the Balkans..." such a captivating book. Once I started, I couldn't stop reading it. Easy to read, obviously, but what really impressed me were the realistic stories. Written in a simple manner, with a picaresque touch, the short stories reveal the Romania a confused, wondering but kind-hearted foreigner had to deal with. And mind you all: he did not come to Romania planning to write this! The book is the outcome of his exposure to the country and the people. I like the style, really reminding of Caragiale's situational comedy, but also of Ionesco's absurd. It is great how modern local "archetype" characters are brought to light and depicted: the reckless driver, the inefficient public servant, the corrupt lawyer, but also the pensive intellectual and the good father figure.I really appreciate the author's objectivity (although the first person singular is widely employed in the book). Negative and positive aspects of Romania are mentioned, trying not to pass judgements nor to praise exceedingly.The stories may seem funny to some, sad to others, even enraging. Truth to say, I consider they cover social problems we, as Romanians, have to deal with and improve. Not only is this a good book to read, it is also educational.Not only an out-of-the-ordiary travel guide, but also a good manners guide. A bon entendeur, salut! Having some curiosity about this ever since release, I jumped at the chance when I saw this edition given away for free and I'm not sorry I did. Of course, it's a collection of very realistic short stories and my main focus are high fantasy series, followed a long distance behind by a few other forms of literary escapism, so it's not anything I'd particularly like, as the rating shows, but that doesn't mean it didn't meet my expectations. At times, it even exceeded them.As for the stories themselves, the vast majority certainly seem extremely real and paint a pretty accurate picture of "democratic" Romania. A few do seem to be akin to those pictures mentioned in "Buried", somewhat falsified, forced, in order to better present the desired concept, but the result justifies the approach and the overall image depicted still holds true. Things change, of course, and some did since the end of the period covered by the stories contained in the book, but in our case few of the changes are major, and even fewer for the better. Started this a month ago as preparatory reading for a hiking trip in Romania. Life intervened, my trip was canceled, and nearly a full month passed before I could pick it again. I had no trouble falling back into it, though, as it consists of short, breezy, episodic glimpses into the experience of both being Romanian and being an ex-pat living in Romania. They're presented, as far as I can tell, in no particular order.It strikes me that this is the perfect way to attempt to capture the psyche of a people. Approach it too directly and you're bound to get mired in over-generalizations and cheap stereotypes. But relate 50+ stories of your real-world encounters with Romanians, from taxi drivers to shepherds to building managers, and a collective truth emerges from the pages. Ormsby's bemused affection for his adopted home shines through.I'll get there for sure in 2014! Mike Ormsby revealed to me so much more than I could have hoped to discover during my short trip to Romania earlier this year. There were times I was shaking my head in disbelief; at the same time I often found myself chuckling as the pages flipped furiously in my palms. Alas, some things did not sound peculiarly Romanian. Many times you will come across stories which you could or would have already experienced in your own backyard. Therein lies the basis of the appeal of this book: it speaks of one country and one people, but their quirks and idiosyncrasies transcend boundaries. Some of the stories annoyed me a lot - but that's a good thing, because it simply means I did recognise the things that irritate me as well about some of my fellow countrymen and the administration of my country.The things have changed quite a bit since the book was first published - some for the best, some for the worst, some remained the same. But reading the book I can remember the '90s, the early 2000s and compare to what is now: there is hope, even if things do not evolve as quick as we would like. So, all in all, thank you for giving the perspective. It was a good read. An easy to read book, with short, sensible stories about life in Romania after the 90s, from the perspective of a Western. Mike Ormsby captures with a keen eye various everyday funny situation in a changing Romania. In the same time, reading this book I could visualize the beauty of the Carpathian Mountains in which the autor fell in love and learn different things I didn't know about Romania. In my opinion, present-day Romania had changed in a good way and some of the presented situations are no longer found. Terrific book by scouse journalist and fellow Beatles fan Mike Ormsby. I love it as I discovered Romania this year and it tells me lots of things about life in Bucharest that I can relate to. I'm not sure how people who haven't visited Bucharest will find it but Mike is a journalist and this reads like, funny, Letters from Romania with a real sense of place, characters, timing; every chapter ends with a punch-line. Fun and true! I would really recommend it to my foreign friends before arriving to Romania. Loved this book - so funny & very keen in his perception.... anytime I got frustrated as being the American in Romania, I read a chapter, laughed, & felt much better! Satisfying collection of articles/blogs on Romania seen over some 20 years. Fascinating insight to a foreign culture. Fabulous read. Funny, enlightening about a country I don't know well at all. Highly enjoyable. 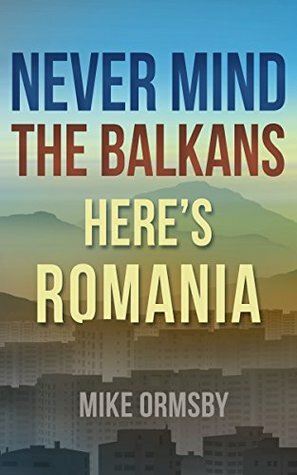 Never Mind The Balkins, Here's Romania was a free book from BookBub. I gave it four starsinstead of five because initially, I found the book had crude, vulgar and abrasive details. The author, Mike Ornsby, writes in the first person masterfully and uses vivid description and interesting storylines about the people, landscape, food, politics, and his experiences in Romania.In the section Too Good To BeTrue, Mike is hiking a mountain in Transylvania with his friends, George, Alina and their 8 year old daughter, Catrinal. A sudden lightning and thunderstorm hits and they are running for their lives in heavy torrential rain with the thunderstorm directly overhead and a pack of five hungry territorial sheep herding dogs closing in on them. "The pack of five suddenly splits. Two dogs run left to block our progress. Three run right, to block any retreat. We slow down, surrounded. The dogs close in, legs splayed, eyes aflame, crouching and barking and slavering, teeth exposed like ivory daggers.Suddenly, from nowhere, a barefoot kid scampers down the hill brandishing a huge stick. He yells at the dogs. They freeze, panting and glaring at us. The kid jabs his stick towards a gap in the circle of hackled fur and gives us the nod. We walk towards the gap then run. "Another example is Mike's description of Vasile. "His tanned biceps are as big as rugby balls." This was an interesting, informative and entertaining book. Mike Ormsby scrie despre viata cotidiana din Romania, observand micile (mari) chestiuni care unui occidental I se par pur si simplu absurde, nedrepte sau incorecte. Este agrenat, ca orice alt "vestic", intr-o alta paradigma decat cea balcanica.Scurtele povestiri sunt tragi-comice pentru un roman care le priveste din prisma aceleasi paradigme ca a autorului.Mike Ormsby writes about the daily adventures of life in Romania, observing the smallish things which only a westerner believe to be simply absurd, unjust or unfair. He is functioning, as any other westerner, in a different paradigm than the Balcanic paradigm. He does it best though!The short stories are biter-sweet for a Romanian who looks at them through the same lens as the author. Buna treaba Mike ! Am ales sa scriu cateva randuri in romaneste pentru ca sigur cunosti si vorbesti limba cred ca destul de bine, desi nu stiu de ce ai ales sa scrii cartea in enzleza. Mi-e destul de greu sa numesc o povestire preferata, pentru ca toate sunt bune. Si eu sunt din Sibiu desi la Paltinis am fost doar de vreo 4-5 ori in ultimi 7 ani de cand am descoperit ca pot sa ajung gratuit pana acolo (eu sunt persoana cu handicap). Mi-ar place sa il cunosc pe George si familia lui. Ma bucur ca iti plac meleagurile noastre, in special imprejurimile Sibiului, si ca ai avut noroc sa cunosti oameni ca George care sa iti arate si sa va bucurati impreuna de aceste locuri. Numai bine. Take care. Seeing your country through the eyes of a foreigner can be truly revealing. At first I was set back by the fact that he was only recounting unfortunate events. They were accurate, but not giving a good credit to Romania. By the end of the book I really started to appreciate Ormsby's candor and sense of observation. We, Romanians, do have all those bad characteristics that actually make each story more interesting. And if those arguments were not enough, it is important to say that the author married a Romanian and decided to live in Romania. It's an interesting new perspective on Romania, a view from the outside. However the writing lacks the fun element, the stories become a drag.Can't say I'm impressed, but it's an OK book. For a Romanian it's an interesting read, for a foreigner it's an incomplete view. In the end, it's all for themselves. The book is a very realistic portrayal of Romania.I am a Romanian and I think no foreigner has ever spoken so true about Romania.I do not find it negative, it is the pure truth and it is written with love for the country.Well done! The flows from story to story and is enjoyable in places. However some of the stories are only views from individuals which of course everyone is entitled too but that does not make them true. Abit more history and facts would of made thia an excellent book. These bittersweet stories are all too true, unfortunately. They will make you laugh and cry. If we Romanians can take some of the credit, we must also take some of the responsibility! Ieşim cu imaginea cam şifonată, dar asta e, adevărul doare.